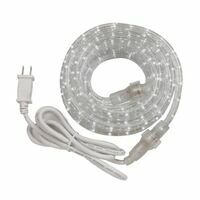 Westek Rope Light Kit, 6 ft Tubing Length, PVC Tubing, LED Lamp, Clear, Includes: 6 ft Power Cord and Mounting Hardware, For Inside and Outside Applications Westek Rope Light Kit, 12 ft Tubing Length, PVC Tubing, LED Lamp, Clear, Includes: 6 ft Power Cord and Mounting Hardware, For Inside and Outside Applications LED tape light with IR wireless remote control, dimming, plug in. Choose from 16 colors with 4 lighting effects for flashing and fading. Adjust the brightness and flashing speed with the IR remote. 3M high-bond tape backing makes installation as easy as peel-and-stick. 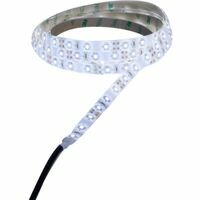 It can be cut every 4" for customized lengths and comes with a special connector so tape light can be linked or run around corners. Kit includes 6' LED light strip, plug-in power adaptor with 5 foot power cord, inline connector and a 24 button remote control and receiver. Transformer input: 120VAC 60Hz, transformer output: 12VDC. 1.5 amp. 6 foot length.